Pennus Mallius is an Imperial commoner and adventurer living a very relaxed life in the Imperial City's Temple District. He claims to be "between adventures" at the moment, but has seemingly fallen in love with big city life and will probably never go on another expedition. The large amount of treasure he gathered during his many travels has bought him a house conveniently located close to his favorite taphouse: The All-Saints Inn, in the northern part of the District. He sleeps on the second floor of his mansion every night between midnight and 6am and kicks the day off with two hours of relaxing on the ground floor. At 8am he ventures outside and strolls lazily around the District all day long, occasionally talking with the other citizens and always ready to hand you a copy of The Black Horse Courier. He returns home at 6pm and spends two hours there before he heads to the inn next door and enjoys a two-hour dinner. He returns back home at 10pm and goes to bed at midnight. He only breaks off this routine once a week, specifically on Middas when he visits the Market District between 4pm and 8pm. During Light the Dragonfires he wisely stays indoors while Mehrunes Dagon terrorizes the District. Every time the Tamrielic calendar turns into a new month, specifically at midnight on the 1st, Pennus will venture out on a small adventure and travel to Leyawiin for some socializing at the Three Sisters' Inn. After crossing the Talos Bridge, he heads south on the Red Ring Road and follows it until he reaches Pell's Gate, then heads south on the Green Road. He will keep walking this road all the way to Leyawiin, on the way passing the city of Bravil. This long trip takes him a whopping twenty-four hours and he usually reaches his destination just before 1am on the following day. Once there, he will book himself in at the inn and spend two days there, relaxing with the regulars. On the third day, at midnight, he will leave the inn and take the long trip back to the Imperial City and his usual routines. Pennus wears a russet felt outfit and a pair of quilted shoes. He also carries his house key and a small amount of gold. When you meet him for the first time, he will politely introduce himself and his former profession: "Pennus Mallius, adventurer-at-large. Just between adventures at present, I'm afraid." When asked about his city of choice, he will explain: "I made quite a lot of gold from my last expedition. I bought this house, invested the rest, and now I'm just living the life of the city gentleman." 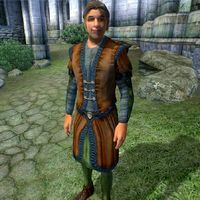 On the 21st of every month, if Bogrum gro-Galash is alive, at midday Pennus will head for the Black Horse Courier in the Market District and spend five hours chatting with the Khajiiti proprietors before resuming his usual routine. This is because he was initially scheduled to take part in an unfinished courier quest.